Given the demographic of Zoella's audience, I knew the books might be a bit of a young read, but since some of my all-time favourite books are technically children’s or YA fiction, I approached the list with an open mind. This was the only book on the list that I had already read, and since there's a full review on my blog already, I won't go into too much detail. All the Bright Places is about two teenagers who are both struggling with life, and although it's an intriguing and heart-breaking story that deals unapologetically with mental health, I couldn’t quite connect with it as deeply as I would hope. Beautiful Broken Things is written in a typical chatty chick lit style, but its strong plot makes it a well-balanced read. The novel deals with very relatable issues of friendship, jealousy and appearance vs reality. Barnard also attempts to destabilise the common but dangerous tendency to romanticise unhappy individuals, by ending on a very grounded and moralised conclusion. We Were Liars was my favourite read from the list, and it even made my 2016 Favourites. The book is centred around a wealthy family who spend each summer on their private island. The 'Liars' are a group of cousins of a similar age and the plot is driven by a mystery: Cadence, the protagonist, can’t remember anything from last summer and no one will talk about the 'incident'. E. Lockhart’s style of narration is what makes this book stand out. It's raw and cutting, but also somewhat fantastical. Cath has just started college and is dealing with being away from home for the first time in her life. Unlike her outgoing twin, Cath suffers from social anxiety and spends much of her time in her room writing fan fiction. 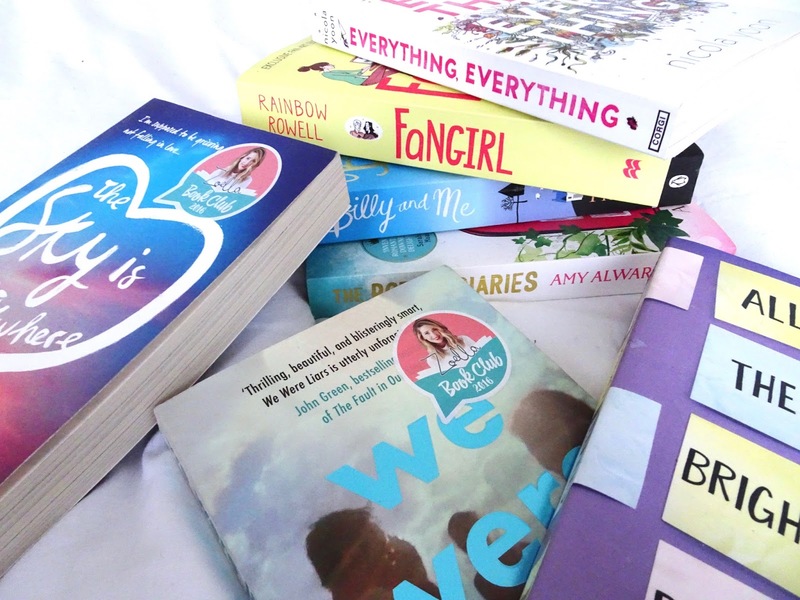 Although Fangirl portrays a lot of teen issues and is conversational in style, it's intriguingly written and full of lovable and genuine characters. The Potion Diaries is a fantasy novel, set in a magical kingdom, tracing the quest of Sam, a girl from a family of alchemists. It's an original and engaging concept, but very much rooted in predictable characterisation. Everything, Everything is an unusual love story about a girl, Madeline, who is allergic to the outside world and hasn’t left her house in seventeen years. When a new guy moves next door, it’s pretty obvious how things are going to end up, but if you can overlook the lack of believability at times, it’s not a bad read. The Sky is Everywhere deals with loss and grief amongst classic teen struggles of identity and love. What makes this novel a success is its intriguing and charismatic characters, as well as the moral dilemmas that protagonist Lennie faces. The book is punctuated with scraps of poetry that Lennie has scribbled onto objects near her school and house, which adds another refreshing layer to the narrative. I attempted a Giovanna Fletcher novel back when I was travelling and struggled to push myself to the end, as I found it crammed too full of clichéd phrases and unnatural dialogue. Unfortunately, I didn’t get on any better with Billy and Me, and found the characters equally as frustrating as the sentences they think and speak. Though I definitely enjoyed some of the above a lot more than others, Zoella’s book club list was a great selection of varied reads. Due to the popularity of the book club, she also brought out another list for autumn. I’d love to know if you’ve also read any of the books from the summer list, or if you would recommend any from the autumn club!